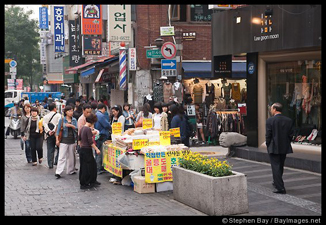 Shoppers on a busy sidewalk in Seoul. A friend forwarded an interesting article from the New York Times on the growing foreign population in South Korea and the effect it has had on a society that has long been proudly homogenous. Even when I was taking Korean classes, our instructor talked about the homogeneity of the country. But although South Korea is now struggling with relatively new issues of racism and prejudice, it shouldn’t put a damper on your plans to visit. During my visit to Seoul last year, I pretty much felt as if I had a spotlight shining on me every time I left my father-in-law’s apartment. Some people stole glances at me on the subway, others outright stared. Little children gawked at me with their mouths hanging open. Despite around 1.2 million foreign residents in Korea, foreign faces still appear to be a novelty. However, whenever anyone came up to talk to me, the attention was always positive. People were unfailingly polite and kind. I wished I had more time to meet and talk to people. Of course, as a tourist rather than an immigrant, it was much easier for me. I was simply there to appreciate the country, and Koreans love to share the many wonderful aspects of their culture with visitors. In the NYT story, Korean women seem to be under a lot of pressure not to marry foreign men. Much of the negative attention seems to be coming from middle-aged Korean men. When I talked to a group of Korean school girls while visiting one of the palaces in Seoul, the girls seemed ecstatic that I had married a Korean man. I don’t think there is as much pressure on Korean men to marry Korean women (although it is definitely there). And among young people there, interracial marriage may still be a surprise, but the kids I spoke to certainly didn’t object. Lest the NYT article make you think that foreigners are chased out of Korea by angry mobs, be assured that tourists are warmly welcomed. My trip to Korea was fantastic, and I can’t wait to go back and see more of the country and hopefully meet and talk to more people. If you get the chance, go! There is so much to see and do there and the people were wonderful. 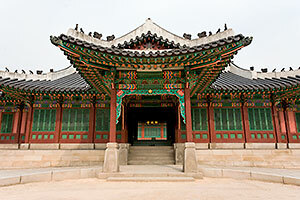 I’ve tried to talk my husband into living in Seoul for a year, but no dice. Previous post: Where did my vacation go?